Dry, frizzy hair can really get you down. Whether you have frizzy hair by nature or your hair just can't handle the weather elements, there is hope. Fortunately, there are an array of frizz control products that can give you the soft, smooth, shiny, manageable hair of your dreams. What Is a Frizz Control Product? The John Frieda Frizz Ease Beyond Smooth Immunity Primer immediately works on frizz. It gradually builds up hair's frizz immunity with each use and provides smoother hair with continued use. The non-silicone formula is enriched with pure coconut oil and a frizz-immunity complex, which works from the inside out, eliminating frizz at the source for easier styling, added control, and better manageability. It forms a protective seal that locks out water and humidity to protect the hair shaft. The potent, non-greasy primer also improves hair's texture for long-lasting results. The brand is recommended by Vogue, InStyle, Influenster, and All Women Stalk. If this primer isn't right for you, you may want to consider the John Frieda Frizz-Ease Extra Strength 6 Effects Serum or the John Frieda Frizz Ease Dream Curls Conditioner. 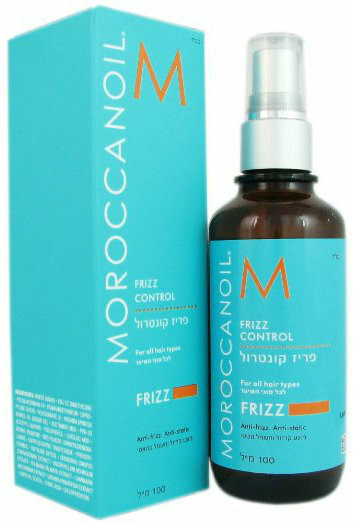 The Moroccanoil Frizz Control works great even in particularly dry or humid conditions. The anti-frizz spray significantly reduces frizz, flyaways, static, and split ends in any weather. It is formulated with argan oil, vitamin E, and keratin to nourish and moisturize with antioxidant and conditioning benefits. It repairs, strengthens, and restores elasticity, so your hair is left smooth, manageable, and ultra shiny. It has a dry oil-like texture and a slight stickiness. It is color-safe, sulfate-free, phosphate-free, and paraben-free. This works on all hair types, but is particularly beneficial for over-processed, frizzy, dry, or curly hair. If you have an oily scalp, it may be too greasy for your roots, so you'll only want to apply it to the bottom of the hair. Most reviewers love the famed tropical-musk scent, which is unlike anything else. It is an Allure Editors' pick and is recommended by the Huffington Post. It is also a favorite at fashion shows and salons around the country. You may also want to pair this with the Moroccanoil Luminous Hairspray for additional frizz-fighting benefits. The Garnier Hair Care Fructis Sleek and Shine Anti-Frizz Serum smooths hair from root to tip and tames frizz immediately. The concentrated smoothing serum works even in 97 percent humidity to help prevent frizz and fight humidity. The proven strength system promises 10 times smoother hair, which can stay sleek and super shiny for up to three days. It is formulated with argan oil from Morocco and apricot oil to condition, as well as silicone to fight frizz and add shine. The formula feels slick and shouldn't weigh hair down. It soaks deep into frizzy, dry hair to smooth each strand, leaving you with soft, shiny hair for days. This can be used on wet or dry hair and works well on all hair types, but is especially ideal for dry, thick, curly, coarse, frizzy, or unmanageable hair. The top-rated serum has a dedicated following, mainly thanks to the unbelievable fruity scent. It is an Allure "Best of Beauty" winner and is recommended by Good Housekeeping. You may also want to pair this with the Garnier Fructis Style Sleek and Shine Anti-Humidity Aerosol Hairspray for additional frizz-fighting benefits. If this one doesn't work for you, consider the Garnier Fructis Sleek and Shine Intensely Smooth Leave-In Conditioning Cream. The Schwarzkopf Styliste Ultime Satin Frizz Control Heat Protection Straightening Spray features a unique array of ingredients that can fight frizz and humidity while protecting your hair from heat tools with 450 F heat protection. The rich micronized spray uses an advanced micro-fix technology with high performing micro-polymers to continuously fight frizz, flyaways, and curl reversion. The lightweight, greaseless formula will leave your hair strong, shiny, and smooth. The straightening spray is designed to provide long-lasting results, with a straight effect for up to four days. The Schwarzkopf brand is recommended by Health Magazine and Influenster. The Schwarzkopf Essence Ultime Satin Frizz Control Conditioner is another highly reviewed item from the best-selling brand. Amazon's Choice for frizz control, the Bed Head Control Freak Serum by TIGI prevents frizz, fights humidity, and improves manageability. It has thermal protection so many reviewers also use it as a straightening serum. It can also make your hairstyle last longer. The lightweight, greaseless serum is moisture-resistant, so it can be used on wet or dry hair. This is especially ideal for frizzy or curly hair. Most reviewers love the scent and how shiny it leaves their hair. It is recommended by Influenster and is a salon favorite. And those are our recommendations for the best frizz control products. As always, be sure to check Wise Bread's Buying Calendar to learn when and how to buy just about anything!